Will consumer spending continue to fall through the end of the year? Will there be a 'Black Christmas'? A Black Christmas is looking likely now. The negative savings rate of July and August are not sustainable. Given the soaring home heating costs this winter coupled with the end of the housing bubble a Black Christmas is looking likely. An economic storm is brewing. What other terms am I missing related to the the housing bubble? 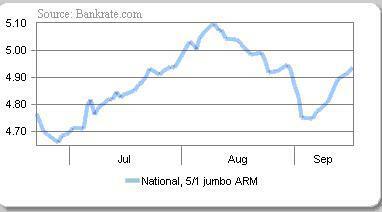 The chart shows that interest rates continue to rise on Adjustable Rate Mortgage (ARM) loans. Credit is tightening. The bubble is under significant pressure on many fronts. American's spending spree is unsustainable. It has been fueled by a credit bubble. The credit bubble is fueling both strong consumer spending and the housing bubble. The personal savings rate is dangerously low. "Americans no longer stuff their savings under their mattresses. Instead, their homes have become the national piggy bank of choice. ( Investor's Business Daily Article )". According to the Federal Reserve Board the US "personal savings rate sank to -1.8% during the second quarter, meaning Americans used credit, asset sales or past savings to underwrite more purchases than their monthly income alone would allow. In contrast, the Japanese save about 7% of their disposable income while many Europeans sock away more than $10 for every $100 they earn, says the OECD ( IBD Article )." What has caused this spending spree? The spending spree has been fueled by the credit bubble. The credit bubble has been fueled by extremely low short term interest rates ( 1% at one point) and a 'global savings glut'. The US has declared a war on savings and savers. Until recently, the interest rate banks were offering was not even keeping up with inflation. Remember when banks were offering .96% on one year CDs. Pathetic. After 9/11, one of the things President Bush told us was to go forth and shop. Shop till you drop. But others wonder how long the consumer, who is already spending much - if not more —- of his disposable income every month, can keep up his buying pace. Housing is the linchpin. If home price appreciation slows or flattens, homeowners will have less equity to tap for future borrowings. A cooling housing market may also make consumers feel less certain real estate holdings will carry them through retirement, encouraging them to stash more at the bank. On October 17th the new bankruptcy laws go into effect. On top of that the new credit card repayment schedule takes effect. Next month, people who have held a credit card for some time should get a surprise: each month, they will have to pay 4 percent of the outstanding balance on the card, not 2 percent. This move was dictated by the federal government's comptroller of the currency in 2003. The phase-in for new customers began in the summer, and October is the big month for existing customers. It's not small change. Almost 40 percent of credit-card holders pay only the minimum balance, according to Cardweb.com. The very strong consumer spending and housing bubble are entirely unsustainable. So how long can this unsustainable situation continue? Not much. The party is almost over. The alcohol which was bought on credit is about to run out. Next year, America will be in for a nasty hangover. A recession is coming. There is so much useful information available at Bankrate.com . They have wonderful charts showing interest rates on different types of loans. Not only this, but they have terrific down to earth articles. Try this article ' 3 borrowing misconceptions to avoid .' Below is an excerpt. The idea of "taking money out of your home" is as much of a misnomer as a misconception. This is usually used in the context of a homeowner with a large share of home equity that is looking to put money into other investments. But let's call it what it is -- borrowing. That borrowing may indeed lead to wealth creation, but only if the rate of return on the investment exceeds the cost of borrowing. Taking money out of the home is not the same as going to the ATM and taking money out of your checking account. Instead, the homeowner is using the lender's money to generate a return and paying interest for the privilege. This loan is secured by the borrower's asset, home equity. Bankrate is an excellent site. :-) Check it out! A new housing bubble site is up and running name The Bursting Bubble. Solid material there. Check it out. Here are excerpts from an interview I had with Pete Czech, who is the creator of the site. What is your involvement with the housing market? First-time buyer looking for a steal. What prompted you to start the site? The frustrations of buying a home in an area where prices are making first-time purchases nearly impossible! The purpose is to provide a community specifically related to the bubble and encourage a fair and honest debate with those who believe it and those who don't. Name some cities that you consider to be bubble markets that are generally under the radar? Cities like Scranton, PA - outside investors are running up the prices in the area, leaving it more difficult for local investors to compete. Lots of cities like these exist - Boise, ID, some parts of Portland, new Mexico. People who can't afford their area are looking to invest elsewhere and make a buck, driving up the prices substantially when the market really doesn't call for it. Thanks Pete for the information and welcome to the housing bubble world. What's truly ridiculous is that Greenspan says he can do nothing to recognize or pop building asset bubbles -- and won't really HIKE rates to tame them. But he has absolutely no problem CUTTING rates when stocks plunge (2001), when there's a terrorist attack (later in 2001, when the bond market goes haywire (1995), etc., etc. In essence, he's saying he can accurately spot a bust and deal with it, but not a boom. How come he doesn't just let the busts play out, too, since "Relying on policymakers to perceive when speculative asset [busts] have developed and then to implement timely policies to address successfully these misalignments in asset prices is simply not realistic"
Who's to say the Dow shouldn't fall 500 points? Or tech stocks plunge? Or home prices drop? Excellent comments. It would be great for Greenspan to answer those questions. In Greenspan's speech today to the National Association for Business Economics Annual Meeting in Chicago he basically was covering his rear. Relying on policymakers to perceive when speculative asset bubbles have developed and then to implement timely policies to address successfully these misalignments in asset prices is simply not realistic. Perhaps. But much more importantly, your policy of lowering short term interest rates to such ridiculous low levels ( 1%), for such a long period of time, was a very significant factor in the 'speculative asset bubble' ( aka housing bubble) that we now face. Greenspan you are not off the hook. Inventory is swelling across the bubble markets. The number of days on the market is also climbing. "Total housing inventory levels rose 3.5 percent at the end of August to 2.86 million existing homes available for sale, which represents a 4.7-month supply at the current sales pace." (NAR). The 3.5% rise in inventory is just between the end of July to the end of August. That is huge. The inventory is rapidly climbing. The 'tight inventory' that David Lereah spoke of at the beginning of the month is rapidly ending. The balance is shifting from seller to buyer. The Pinnellas County, Fl Realtors Organization released this report on housing in the Tampa area. They declared that "In fact, the local housing market is in excellent shape with a potential for significant housing equity gains, particularly for homebuyers who plan to remain in their house for the long run." The local housing market will experience a price decline of 5% only under extreme unlikely scenarios. For example, mortgage rates rising to 13.5% in combination with local job losses totaling 66,000 could lead to a price decline. Could lead to a price decline? Price declines would be a virtual certainty. If those conditions happen price declines would be far greater then 5%. The results of their stress test is complete BS. Today, Alan Greenspan addressed the MBA's ( Mortgage Banker's Association) annual convention which is held in Palm Desert, CA ( a bubble market). He addressed them via satellite. A copy of his speech can be found here. Below are the key paragraphs. The key sentences have been made bold. Over the past decade, the market value of the stock of owner-occupied homes1 has risen annually by approximately 9 percent on average, from $8 trillion at the end of 1995 to $18 trillion at the end of June of this year. Home mortgage debt linked to these structures has risen at a somewhat faster rate. Nonetheless, it is difficult to dismiss the conclusion that a significant amount of consumption is driven by capital gains on some combination of both stocks and residences, with the latter being financed predominantly by home equity extraction. presumably, consumption expenditure growth. The personal saving rate, accordingly, would rise. Carrying the hypothesis further, imports of consumer goods would surely decline as would those imported intermediate products that support them. And one would assume that the U.S. trade and current account deficits would shrink as well, all else being equal. How significant and disruptive such adjustments turn out to be is an open question. Nonetheless, as I have pointed out in previous commentary, their economic effect will, to a large extent, depend on the flexibility inherent in our economy. In a highly flexible economy, such as the United States, shocks should be largely absorbed by changes in prices, interest rates, and exchange rates, rather than by wrenching declines in output and employment, a more likely outcome in a less flexible economy. As I noted earlier, we can have little doubt that the exceptionally low level of home mortgage interest rates has been a major driver of the recent surge of homebuilding and home turnover and the steep climb in home prices. Indeed, home prices have been rising sharply in many countries around the world. In the United States, signs of froth have clearly emerged in some local markets where home prices seem to have risen to unsustainable levels. It is still too early to judge whether the froth will become evident on a widening geographic scale, or whether recent indications of some easing of speculative pressures signal the onset of a moderating trend. The housing market in the United States is quite heterogeneous, and it does not facilitate the easy diffusion of local excesses. Instead, we have a collection of local markets only loosely connected by such factors as mortgage interest rates and, over the longer term, migration and construction capacity. As a consequence, the behavior of home prices varies widely across the nation. Speculation in homes is also largely local, especially for owner-occupied residences. For homeowners to realize accumulated capital gains on a residence--a precondition of a speculative market--they must move. Another formidable barrier to speculative activity is that home sales involve significant commissions, taxes, points, and other fees, which average in the neighborhood of 9 percent of the sales price. Where sales by owner-occupants predominate, speculative turnover of homes is difficult. The apparent froth in housing markets may have spilled over into mortgage markets. The dramatic increase in the prevalence of interest-only loans, as well as the introduction of other, more-exotic forms of adjustable-rate mortgages, are developments that bear close scrutiny. To be sure, these financing vehicles have their appropriate uses. But to the extent that some households may be employing these instruments to purchase a home that would otherwise be unaffordable, their use is adding to the pressures in the marketplace. Over the past few years, a great deal of attention has focused on the growing range of loan choices available to mortgage borrowers. The menu, as you know, now features a long list of novel mortgage products, not only interest-only mortgages but also mortgages with forty-year amortization schedules and option ARMs, which allow for a limited amount of negative amortization. These products could be cause for some concern both because they expose borrowers to more interest-rate and house-price risk than the standard thirty-year, fixed-rate mortgage and because they are seen as vehicles that enable marginally qualified, highly leveraged borrowers to purchase homes at inflated prices. In the event of widespread cooling in house prices, these borrowers, and the institutions that service them, could be exposed to significant losses. In summary, it is encouraging to find that, despite the rapid growth of mortgage debt, only a small fraction of households across the country have loan-to-value ratios greater than 90 percent. Thus, the vast majority of homeowners have a sizable equity cushion with which to absorb a potential decline in house prices. In addition, the LTVs for recent homebuyers appear to be lower in those states that have experienced the most explosive run-up in house prices and that, conceivably, could be at risk for the largest price reversal. That said, the situation clearly will require our ongoing scrutiny in the period ahead, lest more adverse trends emerge. The mortgage industry is out of contol. It needs to be tamed by the Federal Reserve. Greenspan needs to tell them flat out that a negative amortization, interest only, adjustable rate mortagage for a buyer with a 550 credit score who files a no doc loan is completely unacceptable. Greenspan went light on them despite the fact the he addressed them via satellite. The National Association of Realtors reported that "Existing-home sales rose in August to the second-highest pace on record." Not only that but there were "strong price gains in a market of tight supply." Total existing-home sales including single-family, townhomes, condominiums and co-ops increased 2.0 percent in August to a seasonally adjusted annual rate1 of 7.29 million from a pace of 7.15 million in July. Sales were 7.8 percent higher than the 6.76 million-unit pace in August 2004; the record was 7.35 million in June of this year. Lots of homes selling. Impressive. Big picture looks all rosy? Total housing inventory levels rose 3.5 percent at the end of August to 2.86 million existing homes available for sale, which represents a 4.7-month supply at the current sales pace. Historically, a supply of around six months is reflective of a market in balance between home buyers and sellers. Inventory is rising. A 3.5% rise in inventory for one month is significant. I fully expect that the August number we will see a even larger percentage rise in inventory. David Lereah is admitting to rising inventory. He sees "favorable affordability conditions." Sure, Souix Falls, SD has 'favorable affordability,' but San Diego, LA, Bakerfield, Miami, Boston, NYC, and Phoenix are experiencing a historic lack of affordability. Mean Sales Price for Existing Homes price by region. Notice, how the percentage increase is significantly lower for the mean then the median home price. Why? Please post your theories. It was bought about 6 months ago and renovated. Even if 150K was put into renovating it, that still leaves a huge profit for Ricardo. So will it sell for this price in a reasonable amount of time? Probably not. I've mentioned this before but I think it bears repeating. If you really don't think there is a bubble, please tell me what other period of time I could have done the following. I bought my home in Long Island in Dec 1998 for $263K. I sold it in Aug. 2004 for $540K. I walked away with $250K profit. That's over $41K per year tax free. It's like I had a second income for those 6 years and didn't know it. Given all that gloom and doom, you would think that homeowners' financial challenges would be visible in their payment performances on their mortgages. With such household debts, you would think that growing numbers of borrowers might be falling behind, paying their mortgage lenders late and maybe even sliding toward foreclosure. But the reverse is true: Late payments on home mortgages were actually lower in mid-2005 than they were at the same time the year before -- 4.3 percent of all homeowners were at least slightly behind on their payments this year vs. 4.6 percent last year. Foreclosure rates are low and continue to fall. In mid-2005, 1 percent of all outstanding mortgages were in foreclosure, compared with 1.2 percent in mid-2004. That seems solid. However, perhaps the reason that foreclosures are at a lower rate this year then last is because there are now more markets with strong price appreciation. The people in the high price appreciation areas are more likely to sell if they fall behind on payments. "The next-lowest late-payment rate was in California (1 percent), followed by Virginia (1.3 percent). Everybody knows about California home costs and affordability problems. Plus, its 25.2 percent average appreciation rate last year ranked it fourth in the country. Virginia real estate is less expensive than in California and Hawaii but still well above the national average. And its 20.9 percent appreciation rate last year ranked it the eighth-fastest-inflating state." Where are foreclosure rates the highest? Nationwide, the rate was 1 percent at mid-year. But several states are experiencing foreclosures at two to three times that rate. Ohio had the highest incidence -- 3.3 percent of all loans outstanding were in or beginning the foreclosure process. Next were Indiana (2.8 percent), Kentucky (1.9 percent) and Mississippi (1.7 percent). Also, "foreclosure rates in general are lower in 2005 than they have been in previous decades in part because Fannie Mae, Freddie Mac, the Federal Housing Administration and most major lenders all now use sophisticated "loss mitigation" techniques to keep even the most seriously delinquent borrowers in their homes. The techniques include restructuring loan terms, deferring late balances to the end of the loan and sometimes even lowering interest rates." Debt repayment is being delayed. For many Americans, it is a thin veneer of wealth. Underneath, is a cheaply constructed particle board lifestyle that was manufactured in China. Peter Coy who writes in Business Week, is unconvinced by the Assessing High House Prices: Bubbles, Fundamentals, and misperceptions study. Mr. Coy "read the research underlying the Journal piece, a better title would have been "Housing Markets Are Stable ... Until They're Not." To show that there are no regional housing bubbles--and thus no reason for prices to fall--the economists in effect assume their own conclusion. They assume, without strong evidence, that buyers in each market will continue to expect the same kind of price gains that they've averaged over the past 60 years. If you expect prices to keep rising rapidly, you'll be willing to pay a whole lot today. The market will be stable. But what if buyers in, say, San Francisco suddenly turn pessimistic about the rate of future price increases? That certainly isn't out of the question given how high prices are relative to rents, or incomes, or to prices elsewhere in the country. If they lose faith that the market will climb steeply ad infinitum, then their willingness to pay a huge sum of money now will plummet. And the market will tank. That's practically the definition of a popping bubble. By assuming from the start that such a thing won't happen, the authors are assuming their conclusion. You can finish reading the article here. Peter Coy is right. In a speculative episode one of the reasons a price is so 'high' is because people expect continued rapid price appreciation. A premium is paid for that expected appreciation. Once that expectation is no longer present, the premium is no longer a factor and prices will fall. The loud hiss will happen in the bubble markets. Click on the image for a larger version. Be Safe. 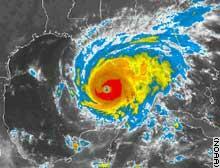 Hurricane Rita is huge. A very powerful storm. Category Five. I hope those in her path flee. Do not attempt to ride her out. She is mean and deadly. My hope is that this storm will weaken significantly before making landfall ( unlikely as that is). 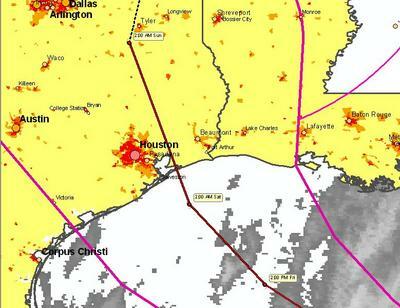 Obviously, there is the huge oil port at Houston and lots of refineries there. Approximately, a third of the nation's oil refining capacity is located between the western edge of Louisiana down to Freeport, TX. All those facilities are facing damage. Gas prices could hit $5 a gallon. The worst case would probably be the storm heading right up Galveston Bay towards Houston. 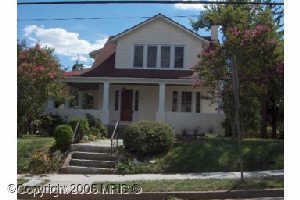 The housing market in Baltimore is hot, hot!!! Prices continue to rise. The percentage of increase isn't as high as we've seen in recent months but they are still on a steady increase just the same. There are plenty of opportunities for investors and home owners alike depending on what your needs are and your future goals. Or this report about the Seattle market "The urban condo market is red hot! The residential market is just as volatile. Inventory can not keep pace with the demand. Seattle is such a diverse city its occupants can choose urban living as well as suburban living. Seattle is comprised of multiple, fascinating cities-within-cities. From waterfront to high-rise to remarkable house boats - your choices are limitless. Prices range from the $500s to over $4 million. Most properties sell in the range of $550,000, and offer two bedrooms and 1.75 baths in 1,600 square feet." Take some of the reports on Realty Times with a large grain of salt. If you search enough you may even find reports that admit that the bubble is over. The second-home market in particular is being hit by a triple whammy of rising oil and gas prices, rising raw materials costs and rising interest rates, Cramer said. Jim Cramer does not have much respect in my book. As oc0010 eloquently wrote in a comment on the Housing Bubble 2 Blog "I cant believe what a waffler this guy is. Just a few months ago he was saying there is no housing bubble. Now he sees that he was wrong so he changes his mind. He did the same thing with the dotcom bust." Nevertheless, Jim Cramer has a large audience and he joins a growing chorus of 'experts' who now take a bubblehead position. A 5/1 jumbo ARM is an "adjustable rate mortgage, that has an initial interest rate for the first five years, and which changes annually thereafter, based on an index. A jumbo mortgage is a home loan that exceeds a certain amount (the 2005 limit is $359,650"
After the Boom: What Term? I am sure many other terms have been used to describe how the housing boom will end. The boom is over in most bubble markets. Now, most bubble markets are in a period of stagnation ( "standoff") . The stagnation period will soon give way to price declines. All these terms are interesting, but numbers are more important. Will the LA market be down 25% inflation adjusted from its peak by December 2007? It was a lovely Sunday afternoon in DC. The neighborhood, Shepherd Park, is the very northern part of the city of Washington. The house is a fully renovated cape cod. It is a wealthy neighborhood that is near a lower middle class neighborhoods. The realtor told me an investor had bought it in February for 565,00 ( this is true as I confirmed it from a public DC government database) and that he had invested about 200K into the house. He wanted 877K for it now. Alright. The realtor, said "one of the houses that is a joy to show." that's a nice chunk of commission. When I walked out of the house the investor showed up and I started chatting with him. I praised the lovely job he had done renovating the house and asked him how much he had spent. "oh 150K." Wait a second, the realtor told me that 200K had been spent renovating. Hmm. Anyway, the realtor said that if the house does not sell by Thursday then the investor may decide to live in it. The investor confirmed this. 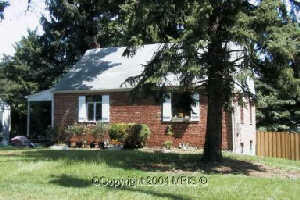 Picture of house before renovation. In a 'On the Contrary' pieced titled 'Pop Goes the Bubble? Maybe It's Time to Cheer' Daniel Akst lays out reasons to cheer a 'pop' in the housing bubble. Unfortunately, all of this hand-wringing tends to distract from the essential truth about soaring home prices, which is that they are a bad thing. So before you become carried away with mourning, let me break the news: the housing bubble never loved you. The bubble is not even your friend. In fact, the very best thing you can say about the passing of this particular bubble is "good riddance." "What's so bad about skyrocketing home prices?" "hey make life awfully difficult for people who aren't already homeowners"
"and do little for people who are, because selling one inflated house only to buy another affords little profit"
"It's true that mounting home equity makes for a nice piggy bank, but it probably also suppresses other kinds of saving and encourages excessive debt"
"it has helped addict global producers to American consumerism, because it gives Americans the confidence - and in many cases the wherewithal - to spend some of the inflated value of their homes"
"Sky-high home prices also divert too much capital into home building from potentially more productive uses. And these prices fuel risky, not especially useful speculation in residential real estate." The columnist further notes "Excessive home prices divert human capital as well. The National Association of Realtors had 1.1 million members at the end of 2004, up from 766,560 in 2000. It's hard to believe that such an increase would have occurred if there had been no housing bubble." Finally, wouldn't it be better for society, and safer for our financial system, if people could buy a home without resorting to the kinds of loans - with deferred amortization, for example, or scant down payments - that are risky for borrowers and lenders alike? Al Mansell, president of the Realtors' association, noted recently that the median down payment by first-time home buyers was just 3 percent, down from 10 percent in the early 1980's. He added that a quarter of first-time buyers who did make down payments used gifts from their parents. But more than 4 out of 10 put down no money at all. My sense, though, is that home prices appear determined to fall, at least where they are most inflated. And having them fall sooner imposes lower costs than having them fall later, while delivering immediate benefits. Great column Daniel. I totally concur you with your sensible opinions regarding the housing bubble. Note: Hopefully this afternoon I will have chance to check out some open houses. It is a lovely day in DC area. I'll take my bike for a ride and check out some houses. HURRICANE KATRINA will lift home prices across the country, the National Association of Realtors declared this week. News outlets that picked up the story passed it along wholesale. MarketWatch.com presented a news release rewrite at the top of its home page with its usual screaming headline. It was left to real estate bloggers to provide context. The association's conclusions seem reasonable: the need to rebuild hundreds of thousands of units will cause a spike in demand for building materials, which will push up construction costs. The storm's impact will restrain mortgage rates. And with inventories already tight nationally, prices can't help but rise, according to David Lereah, the group's chief economist. "The 'general tight inventory' Lereah speaks of is rapidly ending," counters David (no last name given), who writes the Bubble Meter blog and who pointed out that the association was hardly a disinterested observer of real estate markets. Bubble-watchers abound in blogland. There are the Housing Bubble Blog, the Boy in the Plastic Housing Bubble, the Global Bubble Trouble Blog and many others. Most of those not operated by Realtors or others with an interest in ever-rising prices - and even some that are - tend to be skeptical of the market prognostications of Realtors. The housing bubble bloggers will continue to raise bubble awareness and criticize the bubble cheerleaders like Lereah. Here are my five categories of price appreciation / depreciation for 2006, for the bubble markets. Category 1: No Slowdown. Continued double digit price appreciation. Category 3: Stagnating Prices (aka flattening prices) 0% to inflation price appreciation. Most realtors and bankers are saying that in 2006 prices change will be in Category 1, 2 or 3. However, we are more likely to see Category 3 or 4. Inventory is building in the bubble cities. Houses are sitting. Speculators are getting worried. Fear is more powerful then greed. In 2006, stagnating prices and price declines will be the norm in the bubble markets. Real Estate Expert And A Banker Talk B.S. According to Alan Nevin, a longtime local San Diego real estate specialist "You will wait forever" for a bubble to burst in San Diego. Forever is a big word. Alan Nevin is being quoted by the North County Times. The double-digit annual increases in home prices of recent years dropped last summer to about 5 percent to 7 percent a year. That transition eased what had been an unsustainable spiral down to a normal market that can go on indefinitely. "And everybody missed it," said Nevin, director of research at San Diego's MarketPointe Realty Advisors. "People are just starting to recognize it now. Not sure what he means. Plenty jumped in on the speculative episode. Maybe he means that people missed the slowdown. From Oceanside to downtown San Diego, the economy is so well diversified it is nearly invulnerable to collapse, Nevin said. That diversification and the stabilized real estate market makes prospects for the region almost scarily good." The economy is basically healthy. There don't seem to be any weak spots," Nevin said in after-talk remarks. "Right now, there's no one employer that has more than half of 1 percent of the jobs in the county." Ok. But, I am sure there are sectors of the economy that represent close to 5% of the economy (hint you are a participant). Asked where he would recommend buying real estate in the North County coastal area, Nevin replied: "Everywhere. There's no negatives." Nevin is an impassioned cheerleader. Go leverage to the max. Yikes. Nevin's talk was reassuring, said Frank Mercardante, Southwest president and chief executive." He emphasized there is no bubble and there won't be, because of the demand for real estate here in San Diego County," Mercardante said. Mercardante said that as a banker, he has to think of problems that would keep him up at night, and asked Nevin what would keep him up at night about the economy." He said, 'Nothing,' " Mercardante said. Nothing? How about offshoring, federal debt / deficit, high energy costs, security risks, consumer debt, the huge trade deficit. Mercardante spouts complete bullsh*t.
Wachovia CEO: "I'm not predicting a crash by any means"
Speaking Tuesday at the Lehman Brothers Financial Services Conference, Thompson said an increase in problem credit is inevitable and certain pockets of the country are due for a real estate slowdown. But he doesn't believe the United States is facing a nationwide bubble about to burst. "I'm not predicting a crash by any means," he told analysts. Thompson added that rapid real estate appreciation in some markets is still the most obvious threat to credit quality, but the bank's research has led him to believe it's not a widespread threat. "It's not keeping me up at night right now," he said. You can find this article here. No reason for him to be kept up at night, because even if Wachovia loses a ton of money from foreclosures, the CEO will still probably get his golden parachute for escape. The National Association of Realtors (NAR), has this to say about housing, Hurricane Katrina and the economy. The 30-year fixed-rate mortgage is forecast to rise more slowly, reaching 5.9 percent in the fourth quarter, and 6.7 percent by the end of 2006. The national median existing-home price for all housing types is projected to rise 10.8 percent in 2005 to $205,100. With a greater concentration of construction in lower cost areas, the median new-home price should increase 3.8 percent to $229,300 this year before rising at a faster clip of 6.2 percent in 2006. There estimates of the 30yr fixed seem reasonable enough. Although I should add that it is difficult to predict. The 10.8 projected price appreciation for existing homes seems too high. Why? Because prices in many bubble markets are either stagnating or starting with very slow price declines. Plus prices in the low growth stagnating markets (OH) are nowhere near 10%. Given the 13.8 price appreciation rate in the OFHEO report from 2Q 2004 to 2Q 2005, and continued slowing of the market, the price appreciation rate for median existing homes should fall to somewhere near 8.5% for 2005. 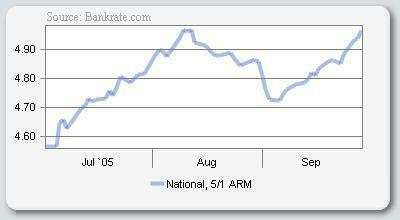 Then in 2006 we may see national price appreciation hitting negative territory. It is estimated that most of the flooded homes will have to be rebuilt, including about 80 percent of the homes in the city of New Orleans. Along with homes that will have to be replaced along the Mississippi and Alabama coastline, a minimum of 200,000 homes have been lost. However, the level of new housing construction will be only 130,000 higher than pre-Katrina projections. The minimum 200,000 homes having been lost is low. Real low. Sadly, many more homes have been lost. "Given the general tight inventory of homes available for sale across the country, rebuilding in the region of the Gulf Coast will place additional pressure on overall home prices", Lereah says. "As displaced residents try to get back on their feet in new locations, home sales have spiked along with rental demandÂin regions surrounding the disaster zone." Mr. Lereah, I suppose everything is 'good' for the housing market. The 'general tight inventory' Lereah speaks of is rapidly ending. In August "inventory, however, jumped significantly with 66% more active listings in Loudoun County and 79% more in Prince William County over the same time last year." David Lereah, NAR's chief economist, says shortages of building materials, made worse by the need to rebuild in areas hit by Katrina, will increase construction costs. I can just see Lereah in his office drooling about the increased construction costs. Okay, that was harsh. But given Lereah's past statements he should go get a pom pom outfit and continue to cheerlead the bubble. In an article titled Is the Real Estate Bubble About to Burst? the author basically argues there will be a soft landing. The real estate bubble is not extremely localized. It has spread from the major bubble cities ( LA, San Fran, Miami) and invaded smaller urban areas and even rural areas. Places like Flagstaff (up 65% in 5 yr), Fresno (123%) , and Fort Lauderdale (115%) have seen huge price appreciation. There are a tremendous number of bubble markets that contain a large percentage of the population. Sure some markets have no bubble ( Dayton, OH), but the bubble is NOT 'extremely localized' as the author says. It means that the foreseen losses are more likely to be smaller profits rather than actual losses. To quote a Florida economist, "The people who think it's a big bubble see a big crash. We just see deceleration. You don't have to worry about house prices going down." Wrong. In many of the markets that have seen huge price appreciation in the last 5 years, there will be actual price losses. The housing market has become a speculative episode in many markets. And all the naysayers and panic mongers can stop predicting the resounding crash of the real estate bubble falling to earth. We are not 'panic mongers,' but rather realists. We base our predictions on looking at the whole picture and comparing it to history. The speculative episode is mortgaging the long term for the short term. It is a destructive phenomenon, and needs to be stopped sooner rather then later. Yes, prices will decline significantly in the bubble markets. Like my mentor, Ben Jones, I consider myself an economic activist' and will continue to battle this speculative episode. "There has been a raging controversy among experts over the question of is there a housing bubble. Is there a housing bubble?" "Yes, there most definitely exists a housing bubble in many of them major metropolitan areas as well as selected non metropolitan areas. In my book, a housing bubble market is a housing market which will decline at least 20% or greater ( inflation adjusted dollars) during the course of 4 years." "Can you please name some areas that are experiencing a housing bubble?" "Sure. Modesto, San Francisco, Sacramento, Las Vegas, Phoenix, Boston, Seattle, Naples, Jacksonville, Miami, Hartford, Providence, Flagstaff and Philadelphia. Of course there are many other places." "Given the increased talk of a housing bubble and Greespan's remarks, why has the housing bubble not burst yet?" "Good question. First I would like to say that many bubble markets have already entered a period of stagnation ( stagnating home prices, building inventory). Secondly, the housing market is a slow moving vehicle, it cannot turn on a dime. But turn it will. This fall, many bubble markets will be seeing price declines. Once, the greedy investors fully realize that the boom is over the bust will come. Fear is a strong factor then greed. The housing bubble is a speculative episode and just like other speculative episodes it will end with a bust not a whimper." "What do you think the Fed will do with short term interest rates?" "By the end of the year short term interest rates will likely be at 4.00%. The fed is unlikely to continue and increase them higher then that because of the perilous nature of the economy." Today, I went to check out a house ( MLS ID#: MC5308496) for sale in my neighborhood. No, don't worry I am not actually considering buying this house. "Original six panel wood doors interior"
The interior of the house is not "charming," in fact the walls are badly painted, the hardwood floor is damaged, the kitchen is outdated ( not granite), and the upstairs bedroom looks terrible. So will it sell at this reduced price in a reasonable time frame? Possibly. I ended up chatting with the realtor. Me: "Well at 489,000 your monthly payments on a fixed 30yr loan would be about 3,000 a month." Realtor: "A bit less maybe 2,800. Or you could take out a crazy ARM." A Women "We have a friend who is looking to buy but is concerned that when she may sell in five years the price won't be good because of the bubble"
Realtor: "She'll do just fine if she holds for five years." Realtor: "This house is cheap. I might make an offer on the house if it doesn't sell soon"
Me: "What would you do with it?" Realtor: "Rent it out for a while"
Me: "But the rent would not cover the mortgage." Realtor: "How much do you think I could rent it out for?" Me: "About 1800 a month." Realtor: "More. It used to be rent out at 1850 a month about 1.5 years ago." Me: "Okay you could rent it out at 2000 a month. That still does not cover the mortgage, taxes and maintenance costs. You would be losing hundreds of dollars a month hoping for future price appreciation"
Realtor: "There are ways to make it work." Realtor: "I could split it into two and rent out the basement." Me: "Is that even legal?" Realtor: "I probably could get a permit. Or perhaps I could get one of those 1% ARM loans." Me: "But then it would be a negative amortization loan." Realtor: "Perhaps. Maybe I could renovate it and sell it for more." Me: "Well it does need major work." We chatted about other things as well. A pleasant individual. Many potential buyers walked through, but there was very little interest in the house due to the high price for a house in a poor condition. We do not offer mortgage loans in New Jersey and Texas. Available programs may be limited in other states. Start rate of 1.00% is fixed for the first 30 days. Fixed payment option is available for the first 12 months. Terms of the payment are based on a margin of 2.10% plus the 1 month MTA Index (2.022% as of February 16, 2005). APR of 4.27% and payment of $643.28 per month is based on a 30-year term, $200,000 loan amount at 1.00%, and may change if the index adjusts after the first 30 days. If minimum payment option is selected, deferred interest may accrue. Interest rate quoted assumes a credit score of 620+ with a loan-to-value (LTV) of 80% on a primary residence. The APR and payment will vary based on the specific terms of the loan selected and verification of information and credit. Rates are subject to change without notice. All loans will be secured by a lien against your property. Not all applicants will be approved. Terms and conditions apply, call for details. AZ Mortgage Banker LIC No. 0904930; Licensed by the Dept. of Corp. under the CA RMLA; GA Residential Mortgage Lender LIC No. 17302; IL Residential Mortgage Licensee; MA Mortgage Lender LIC No. ML2206; Licensed by the New Hampshire Banking Department; LIC by the NJ Dept. of Banking and Insurance; Licensed Mortgage Banker – NYS Banking Department; PA Dept. of Banking Licensee; RI Licensed Lender; 163 Technology Drive, Irvine, CA 92618. Loan programs are offered by Home Loan Center, Inc which is also known as Home Loan Center USA, Inc. in AL, FL, ID, MI, MN, OH, OK, VT, & WY; Online Home Loan Center in NH; LT Loans in NV; and Loan Center, Inc. in WA. If you still have additional questions, please call one of our friendly loan specialist at 1-800-756-0789. There is a tremendous amount of fascinating and timely material on these blogs. Check them out! Home sales in Fairfax County dropped 7.7 percent in July compared to last year. In Arlington, they tumbled nearly 19 percent due to a sharp decline in condo sales. Loudoun County fell 12.3 percent. It's something we've been waiting for. It's just a natural market balance. We thought it was coming last year," said Amy Ritsko-Warren, spokeswoman for the Northern Virginia Association of Realtors. The rising inventory, along with fewer sales, helped push July's average price of a single-family home or townhome in Fairfax County down $19,000 from June, to $597,255. DC is a special market in that there has been strong high paying job growth in the past 4 years. The DC area is likely to see stagnating prices with home price appreciation being near to inflation. So what will Hurricane Katrina's impact be on the housing bubble? Will it be a factor in prolonging the bubble or will it help pop the bubble ? Building materials increase in cost due to increased demand thus causing upward price pressure on new homes. People view housing as a more risky investment due to an enhanced awareness of natural disasters. Gas prices continue to remain high. People have less money to spend on housing. Economy suffers due to the hurricane. Overall, I maintain that the hurricane is a negative factor for the housing boom. 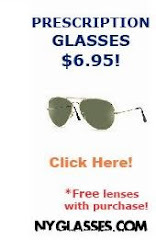 I have to chastise my fellow mortgage professionals for their money-hungry nearsightedness. The interest only and option-ARM (pick your payment) loans are going to come back to haunt the majority of those who have chosen to use them. The default rates on those homes will be far and above the average. In all the years that I have been in the finance/mortgage business, I have only done one interest-only loan, and I refuse to do an option-ARM loan no matter how "sophisticated" the borrower is. The potential for negative amortization has no place in my book. The mortgage companies and lending institutions that are heavily promoting these loan programs don't care about the borrower (their customer! ); all they care about is making a fast buck. Take my word for it, Seth, the majority of all the Johnny newcomer mortgage people will be out of business once rates start moving up. Unfortunately, we have to live with them for now. I can only sit here and feel sorry for the majority of borrowers who have been conned into interest-only and option arm programs. Amen brother! Amen. T.B. is being very responsible. I hope he makes a high income and is not undercut by the major competition from all these irresponsible lenders. Fuel prices in Nevada neared $3 a gallon for unleaded regular and were closer to $4 a gallon in many other parts of the country on Thursday, and AAA Nevada said this state's average prices could quickly increase. "There is concern in the industry how the consumers are going to react whenever you have these kinds of price increases," said Bill Bible, executive director of the Nevada Resort Association which represents most major hotel-casinos. Will Las Vegas see a major bubble bursting as the tourism industry falters due to rising gas prices? Or will some sort of perverse American logic appear that says 'I am so stretched thin financially that I might as well gamble'? The Office of Federal Housing Enterprise oversight (OFHEO) just released their findings on housing for the 2nd quarter. Average U.S. home prices increased 13.43 percent from the second quarter of 2004 through the second quarter of 2005. Appreciation for the most recent quarter was 3.20 percent, or an annualized rate of 12.8 percent. The new data represent the largest four-quarter increase since the second quarter of 1979. 13.43% is huge. This data only goes through the end of June. Notice how the price appreciation for the whole year is 13.43% whereas the annualized price appreciation for the second quarter is 12.8%. Thus there has been a slowdown in the rate of appreciation. I expect third quarter price appreciation of only 1 - 2%. Nevada continues to have the highest appreciation of all states; house prices increased 28.1 percent over the past year and 5.5 percent for the quarter. However, for the first time since the fourth quarter of 2003, Las Vegas is not on the OFHEO list of the 20 fastest growing MSAs. Thirty of the 265 ranked Metropolitan Statistical Areas (MSAs) had four-quarter appreciation exceeding 25 percent. Damn. That means over 10% of MSAs experienced year over year (yoy) price appreciation exceeding 25%. Wow. "The continued price increases are a result of many factors including low mortgage interest rates and the apparent impact of speculative investing," said Lawler. "The robust appreciation rates are striking both in terms of their magnitude and in their geographic scope. However, they are likely unsustainable given the underlying inflation rate, income growth and other factors". The phrase 'apparent impact of speculative investing' should read 'considerable impact of speculative investing'. Its is also worthy to note that of the "Top 20 Metropolitan Statistical Areas and Divisions With Highest Rates of House Price Appreciation" a full 14 of them were either in Florida or California. The destruction is huge. The loss of life is rising. It is all very sad. I hope and pray that the death toll will stop rising. The survivors will need help. I made a donation to the Red Cross tonight.